Kangertech is established as a leading manufacturer in the coil industry, earning the respect and loyalty of hundreds of thousands of vapers worldwide. 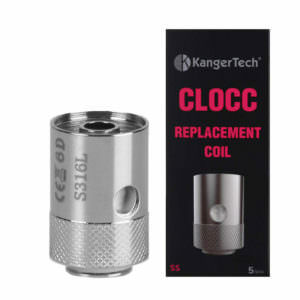 By using only the best metals and the purest cotton for their SOCC, CLOCC, SSOCC range of coils, that feature variable wattage and TC control modes, Kangertech are definitely ahead of the game. As they manufacture a huge range of atomiser heads, they constantly aim to improve and create new coils to help you perfect your vape. Vapestreams are impressed with this outstanding range, which is why we decided to stock this great product in our catalogue. And with orders over £20 you get free delivery.